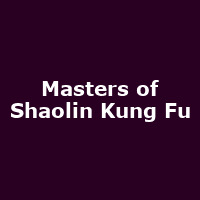 "Over the past few years, the Masters of Shaolin Kung Fu from China, have made a name for themselves all over Europe with their thrilling performances and have developed, if one is to believe the press, into possibly one of the most successful and authentic Shaolin Kung Fu shows in the world. Reason enough for the Masters of Shaolin Kung Fu to now present their countless fans a completely new stage show. The main attraction of the show will be traditional Shaolin Kung Fu, spectacular weapon demonstrations and hard Chi Gong performances, which are sure to take the astonished spectator's breath away. Combined with excellent lighting, sound and an authentic and striking stage set, the new show from the Masters of Shaolin Kung Fu will carry the visitor off into the fascinating and incredible world of this millennia-old martial art."